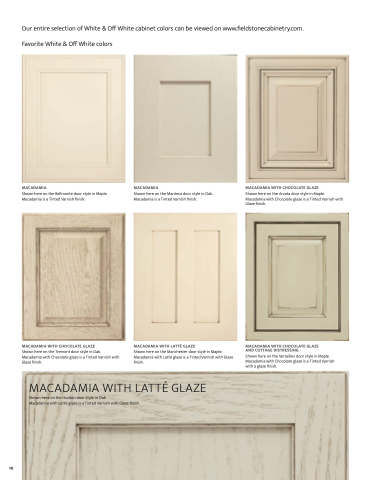 Shown here on the Monte Carlo door style in Maple. Macadamia with Bronze glaze is a Tinted Varnish with Glaze  nish. Shown here on the Arcata door style in Maple. Macadamia with Chocolate glaze is a Tinted Varnish with Glaze  nish. Shown here on the Tremont door style in Oak. Macadamia with Chocolate glaze is a Tinted Varnish with Glaze  nish. Shown here on the Manchester door style in Maple. Macadamia with Latté glaze is a Tinted Varnish with Glaze  nish. Shown here on the Bellmonte door style in Oak. Macadamia is a Tinted Varnish  nish. Shown here on the Hudson door style in Oak. Macadamia with Latté glaze is a Tinted Varnish with Glaze  nish. Shown here on the Reading door style in Maple. Macadamia with Nickel glaze is a Tinted Varnish with Glaze  nish.